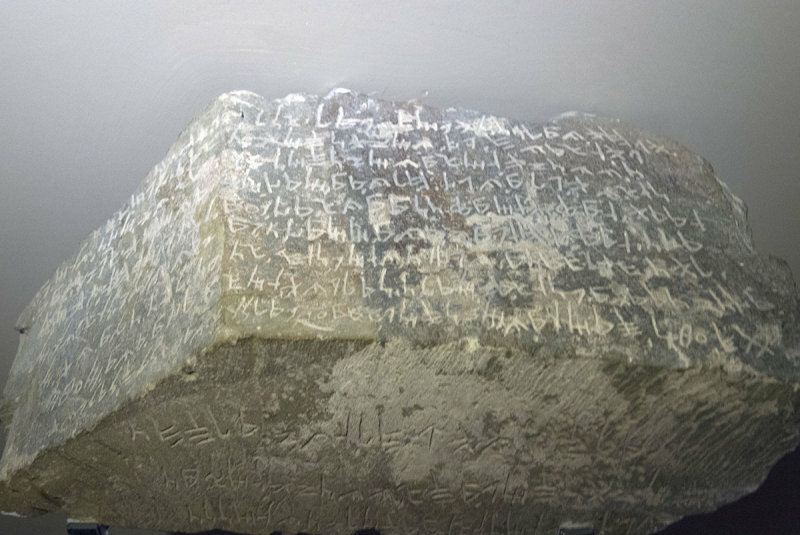 Translation of the inscription: Slprn, the governor of ylbs, gave land to his servant, to msnzms in tmrs. The latter (he) planted in the field of the first-born in the days of slprn and gave another (a foreigner?) the vineyard in drwz and also mts gave kls a wlyw in wrykly. Furthermore mts gave kls the land of the prince and (the) vineyards on the land of the prince below the city (qrt?) and (the) vineyard below ml. After blkr settled in it, mts cursed so no one might wrongfully seize it – field or vineyard – from the possession of the family (?) of kls, and particularly all of which mts had given to him. And when msnzms sent him (kls) into exile in the days of zwss, king kryk turned over all the land to msn zms. And the envoy msd gave his daughter mts to kls. And in the days of zwss he turned her over to msn zms. And the epigrapher phls had this inscription prepared.